In the recent article “Can Stem Cells Be Used to Enhance Cognition?” (2015) (html, pdf) , Goldberg and Blurton-Jones examine the potential to enhance cognition through (1) endogenous neurogenesis and (2) stem cell transplantation. This post is a summary of their findings. This post goes into fairly deep technical detail. If you prefer, you can get the gist of the story in the summary section below. An important but separate issue is whether neural stem cell implantation is ethical or desirable; social and ethical implications of this research are discussed elsewhere. 1 This post simply examines what is possible so far. The equilibrium between cell loss and cell replacement is well maintained by stem cells in most adult tissues, except for the pancreas, heart, and brain. As the brain gets older, its ability to maintain itself through producing new neurons is reduced. (Rossi et al., 2008). This loss of this cell equilibrium in the brain is greatly correlated with age-related neurogenerative disorders like Parkinson’s and Alzheimer’s Disease. Stem cells have direct and indirect influences on cognition through multiple mechanisms. Figure 8.2. Considerable evidence supports the notion that both adult neurogenesis and neural stem cell transplantation can contribute to cognition. Factors such as exercise, selective serotonin reuptake inhibitors (SSRIs), and inflammation can modulate adult neurogenesis, leading to enhanced or impaired cognition. 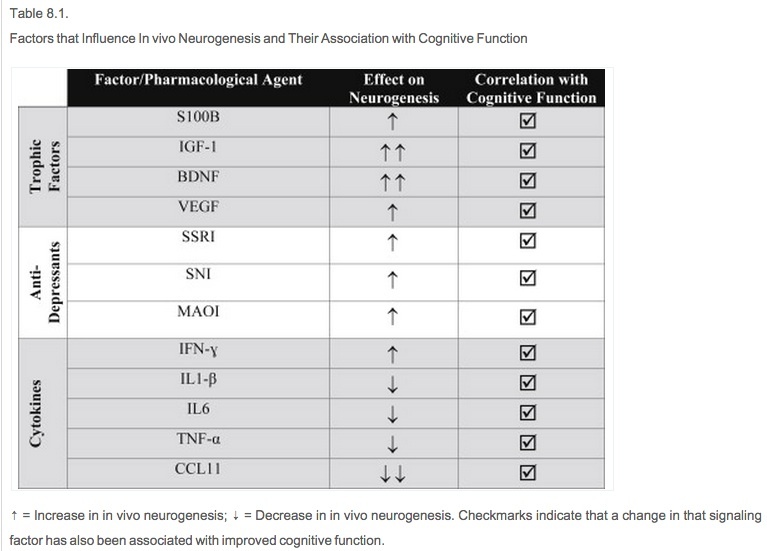 BDNF, brain-derived neurotrophic factor; bFGF, basic fibroblast growth factor; ChAT, choline acetyltransferase; GDNF, glial cell–derived neurotrophic factor; IFN, interferon; IGF, insulin-like growth factor; IL, interleukin; TNF, tumor necrosis factor; NGF, nerve growth factor. 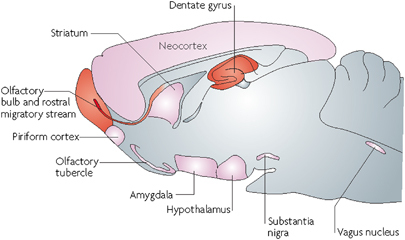 Areas of neurogenesis in the adult rat brain. Red – confirmed neurogenesis; pink – possible neurogenesis. From Gould (2007). Ernst et al. (2014) most recently used the radiocarbon dating approach to provide compelling new data that SVZ-derived newborn neurons can also migrate into the adjacent striatum in humans, giving rise to cholinergic interneurons. The existence of endogenous neural stem cells (NSCs) means that we can potentially insert new, healthy neurons where old neurons are dead or dysfunctional. It also means that we could add neurons to various regions of the brain to enhance their capability. These profound discoveries continue to provoke the question, What are the functional consequences of adult neurogenesis? Villeda et al. (2011) showed that aged blood could reduce both neurogenesis and cognitive function in young mice. Furthermore, aged mice injected with the plasma of young mice exhibited increased hippocampal neurogenesis. Interestingly, the effects of old and young plasma seem to be mediated via specific chemokines such as CCL11: injection of this chemokine alone into young mice impaired both neurogenesis and cognition. 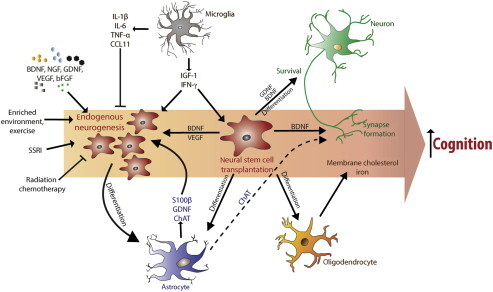 Thus the peripheral immune system and changes in inflammatory state that occur with age seem to play a critical role in age-associated changes in neurogenesis. Later, it was shown that radial glia maintain proliferative activity and may promote the generation, differentiation, and survival of newborn neurons in adult teleost fish and in mice (Merkle et al., 2004, Zupanc, 2001 and Zupanc and Clint, 2003). Reports have suggested, for example, that (CNS) central nervous system–specific T cells are required for spatial learning and the maintenance of hippocampal neurogenesis in adulthood (Ziv et al., 2006). However, evidence that the mood-improving effects of antidepressants did not depend on neurogenesis, but rather neuronal remodeling, arose in 2008; the blockade of neurogenesis failed to diminish the antidepressant activity of several SSRIs (Bessa et al., 2009). HOWEVER the precise mechanistic relationship between BDNF neurogenesis and cognition has yet to be directly examined. Environmental Enrichment (Jankowsky et al., 2005 and Nichol et al., 2007). (Wolf et al., 2006 and Madronal et al., 2010). IGF-1 and VEGF are more strongly implicated in hippocampal neurogenesis (Ding et al., 2006 and Nichol et al., 2009). One of the first studies to examine the potential effect of NSC transplantation in aging injected human NSCs into the lateral ventricle of aged rats, leading to improved performance in spatial learning and memory as measured in the Morris water maze task (Qu et al., 2001). We found that murine NSC transplantation in the triple transgenic (3xTg-AD) model of AD improves cognition in Morris water maze and novel object recognition tasks via a BDNF-dependent mechanism (Blurton-Jones et al., 2009). Syngeneic NSCs were transplanted bilaterally into the striatum of aged α-synuclein mice, and 1 month later motor and cognitive behavior was examined. NSCs survive in the striatum and begin to differentiate into glia (glial fibrillary acidic protein) and neurons (doublecortin) (Figure 8.4). In these initial studies we found robust improvements not only in motor function but also in cognitive function, and, again, BDNF seems to be central to these improvements. Until recently, few studies have shown an enhanced benefit of stem cell transplantation in regularly-functioning adult brains. In 2013, Han et al. (2013) showed that human glial progenitor transplantation into the frontal cortex of immune-deficient neonatal mice led to significant enhancements in the cognitive function of adult and aged mice. In contrast, transplantation of murine glial progenitors had no such effect. Question: Why did human glial progenitor cells improve cognition in mice but transplantation of the mouse-derived glial progenitor cells didn’t? One potential explanation for the differential effect between human and murine progenitors may relate to species-specific differences in calcium wave propagation, a mechanism by which astrocytes communicate. Human glial progenitor calcium waves propagated at least threefold faster than did mouse cells, which may be attributable to their much larger size and structural complexity. These differences also likely contributed to the heightened basal level of excitatory transmission and enhanced long-term potentiation that also were observed in this study. Interestingly, this group found significant improvements in passive avoidance, Morris water maze performance, and spontaneous locomotor activity in aged mice receiving ChAT-expressing stem cells. However, it is unknown how much the immune system plays a complicating factor in these studies. The traditional goal of NSC was to replace dead/ dysfunctional neurons for neurological disorders. In the context of Parkinsons Disease, this has been disappointing, yielding only mild effects on motor movement and no significant effects on cognition. Arguments can be made for transplantation of NSCs and progenitors of other cell types (like astrocytes) that might influence cognition via more indirect mechanisms. (Again, see the complicating figure). Most studies of glial progenitor transplantation focused on spinal cord disease and injury. One exception: Bruckner and Arendt, (1992) compared capacity of fetal brain tissue and purified astrocytes to improve ethanol-induced cognitive deficits. Bradbury et al 1995 reported – astrocyte-induced cognitive imporvements likely resulted from altered immune and trophic activity. Finally, recent developments in cell reprogramming research have identified that astrocytes may be a more useful parent cell type than the commonly used skin fibroblast (Tian et al., 2011). Tumorigenesis. Because the neural stem cells replicate, they could be the seed of a tumor. Delivering Stem Cells to the Brain. There is no easy way to do it. Further research aims to safely adapt these methods for clinical use. Stem cells have direct and indirect influences on cognition through multiple mechanisms. There is a growing body of evidence that transplantation of neural stem cells does indeed have reliable positive effects on cognition, and is a promising method for both treating neurological disorders and improving cognition in healthy adults. In future posts, I will examine more potential methods for inducing neurogenesis and neuroplasticity, and their potential effects on cognition. This entry was posted in Articles, Research, Technical Reports and tagged neurogenesis on April 25, 2015 by Stephen Frey.